Hypnosis is a relaxed state of awareness that bypasses your conscious mind and allows you to change unwanted behaviours such as emotional eating problems, smoking and panic disorders. Although many people want to try hypnotherapy Melbourne has only a few qualified practitioners who understand the subtle semantics and techniques required to bypass the critical mind and create a direct portal to the subconscious. So congratulations on doing your research; you’ve come to the right place! Clinical Hypnosis has been used for hundreds of years to help people with weight loss, anxiety, PTSD and so much more. It’s not like traditional therapies such as counselling, where you have to spend a lot of time (and money) on a weekly basis to see any tangible results. So many of my clients have been through the ‘psychotherapy revolving door’. They’re tired of talking about their problems; they just want them gone! So you’ll be pleased to know that the average number of sessions required for any given issue is usually only about three. I’ve been a professional consulting hypnotherapist for a long time and one thing I’ve learnt is that everybody is different. You have to treat each case individually and tailor the treatment according to each person’s needs. But don’t just take my word for it; watch Kerri’s testimonial to see how she overcame her obstacles by working very closely with me. Kerri initially wanted to lose weight, but she was far too overwhelmed. Since being overwhelmed is a major barrier to weight loss, we worked on this first. After that she was ready to tackle the weight. You might have tried hypnosis in various suburbs around Melbourne before and been disappointed – but remember; all hypnotherapists are not equal as you will soon discover when you continue to read on. I don’t just read out a generic script while you close your eyes – I speak to your subconscious in a language it understands, using therapy that hones in on one issue at a time. I pay attention to what you’re telling me; specifically the underlying messages that give me clues as to what is really causing the problem – and then I design your treatment program to fix it. For example, let’s say you’re trying to lose weight: It’s not enough just to give you shallow generic suggestions like ‘you will eat healthy foods’. This might work initially but the results won’t last. The fact is: if you’re not eating healthy foods, there’s usually a reason why not – it’s my job to diagnose the reasons and devise a solution that not only works, but has a permanent positive impact. When you’re deciding on which hypnotherapist to work with, you need to be sure that person has the right skills required to treat your issue. You may not know this, but hypnotherapy can be practised by anybody in Melbourne, without the need for a formal qualification. Do they have an accredited qualification? How long have they been practising? How many clients do they treat per year? You should only choose a hypnotherapist who has a government accredited qualification. After all, do you really want someone who has done a weekend course in hypnosis messing with your mind? 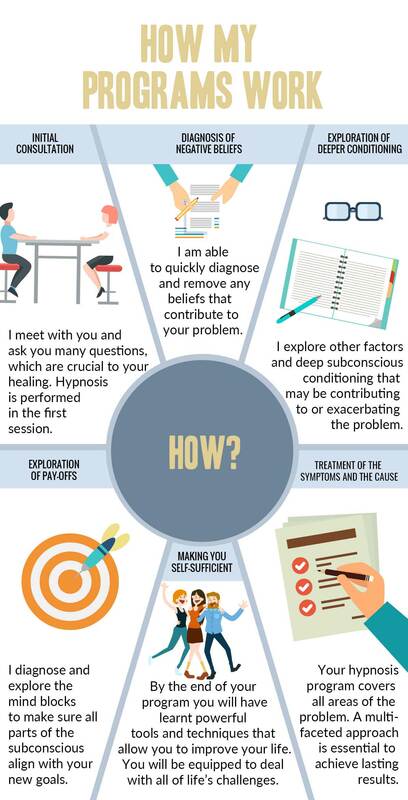 How Can a Hypnotherapy Expert Help You? If you have something you want to work on but you’re not sure if hypnosis is appropriate, give me a call or send an email and I will tell you if I can help. When you’ve been practising clinical hypnosis as long as I have, you see some pretty amazing transformations. People often ask me ‘what is your success rate?’ It’s a fair question – but one I don’t have the answer to. I don’t have the resources to conduct this kind of research and I would suggest that if any Melbourne Hypnotherapist tells you their ‘success rate’ you ask to see the research behind this figure (which has probably been plucked out of thin air). Many people are dubious about hypnosis and I don’t blame them – stage hypnotists give us a bad name. The primary intention of a stage hypnotist is to manipulate his subjects up on the stage for his own amusement. Everything you do is governed by your subconscious beliefs. When you begin the process of relaxation, your brainwave frequency lowers itself. As a result, your conscious mind, the part of your mind that decides whether something is true or not, is turned right down. With your permission, a hypnotherapist directs positive suggestions to your subconscious that are designed to remove the beliefs that are causing your problem. Many studies have proven that hypnosis is a safe and effective modality. Check out this published journal article on the efficacy of hypnosis for depression. You will not allow yourself to go into a state of hypnosis if you don’t trust your therapist. Read more about it in this article: Will Hypnosis Work For Me? If you are interested in hypnotherapy Melbourne has only a few truly qualified practitioners, so feel free to contact me at any time and I will be delighted to answer your questions. This free guided video affirmation helps you conquer fear that holds you back and turbo-charges your inspiration. It’s hard enough to stick to your weight loss plan without other people constantly policing your eating habits. Learn how to deal with food-shamers in this article. This is the second in my series on permanent weight loss. It explains why your thoughts and beliefs play a significant role in your ability to maintain a comfortable healthy weight long-term.